Here is a fun online tool for you to bookmark. 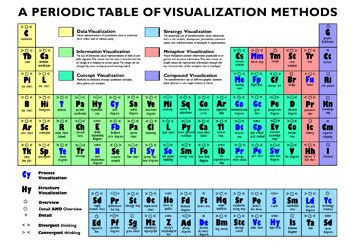 The Periodic Table of Visualization Methods has been assembled by a team of media, communications, and management specialists. It’s primary target seems to be business people and engineers, rather than artists, but it's still a brilliant piece of work ;-) You can roll your mouse over the “elements” to see an example of each strategy. That's pretty cool! However do you find all these great tools. I've always found diagramming a wonderful learning tool - whether it was diagramming sentences or outlining a chapter or planning a project with a Gantt chart, there's something about the visual flow that helps me understand the connections and retain the info. My favorite methods have always involved some sort of diagramming too. The nice thing about this chart is that it suggests some methods that I *never* would have thought of on my own!